My morning was going well, I had written the above quote for our ‘New Earth Community‘ in preparation for my weekly facebook live… then all of a sudden, life literally took me over as I felt anger embody my whole being. Thankfully Tom didn’t respond to my outbursts as he had seen them for a while now on and off. He remained quiet, being concerned but trusted me to deal with it all myself. Everything was making me feel more angry. I couldn’t take it anymore, so I did what I used to do when I was younger… storm off to my bedroom and cried on my bed for a good couple of hours. I eventually calmed down, took some deep breathes and got myself up and sat down with Tom to talk about what was happening. I explained it was as if I was under attack and felt completely unimportant, ugly and unloved, but I would get to the bottom of it. All I needed from him was to continue loving me unconditionally. After so many hours crying and feeling sorry for myself I sure looked a mess and decided I didn’t want to confront myself in front of the camera, so I postponed my facebook live performance!!!! Instead I gathered myself together and took it easy for the rest of the evening. Bedtime is normally my heaven and am blessed with sleeping well, sometimes long, sometimes short, but this night as I heard Tom purring away… I felt enormous pressure in my heart space and stomach. A gigantic presence of throbbing. Wow so grand and as normal, I began to breathe deep, opening up to receive my own love, to feel it flowing through me and love me unconditionally. After a while, I asked myself what on Earth was causing this anger to attack me so badly? I began to breath more calmly, opening up to insights I recognised receiving before… but this time it felt different. It was as if I had opened up into a much deeper and wider space within myself… yet it no longer felt like my space. It was a space where everything existed as one interconnected whole, I saw clearly my journey as part of the magnificent tapestry of life. I felt a deep knowingness, rather than only intellectually understanding and a sense of peace consumed me knowing everything was perfectly ok.
My first insight was as a young girl, about to become a teenager and a woman, I had began to bleed and was quite concerned… I don’t remember so much of my childhood but I remember my dad giving me big pads to wear and a book about the birds and the bees to read. My mum must of been working or not feeling well. I missed her presence, of feeling loved and adored. We had recently moved home, away from my best friend, I was trying hard to make new friends but we all know that’s not so easy. I was a bubbly, open person, swopping best friends a lot AND became a target for bullies. It was during these 5 years I felt a deep loneliness; of feeling alone, unloved, unimportant AND ugly, creep into my being. Life was tough and when I didn’t get attention at home, I’d shout, slam the door and run up to my bedroom. I found most girls at school to be bullies, so I focused my attention on boys… searching for love, value and hearing that I was pretty. My next insight was 27 years later. I had met my husband Tom 13 years before and we were enjoying a wonderful life together at home with our family and with our work. I was so happy, I’d met such a wise, kind and gentle man who adored me and loved me unconditionally. I remember crying once in his arms because I was so happy. I had joined a group class ‘Reading & Healing Energy’ to discover more about myself and the world. The world was my oyster… and then in 2004 Tom suffered 2 heart attacks and as he lay in hospital, I felt my body go into a deep shock. My next insight was now, 13 years later, looking back and understanding how I had built my happiness around Tom… and his near death had freaked me out AND broke open a deep wound that I’d been carrying around since I was 12 years old. This had happened even though I’d begun to understand how life worked, how IAM love and how I can only make myself happy. The wound of feeling alone, unloved & unimportant was a deep one that I know I share with all Humankind. I know this wound is deep and goes back even further, to the time Humankind chose to be separate from All That Is in order to experience knowing self, exploring and discovering Who You Truly Are. You can read & listen more about this in my post She Heals His Wound. I realised I could of felt deeper into my wound back then, but I obviously needed to discover more depth of this wound; to feel every ounce of anger and sadness as it oozed through my body/mind for me to embrace it all and truly know I have never been separate, unloved or powerless. How essential our Human experience is, being able to feel the loving presence and compassion of a loved one AND the absence of this, knowing they are playing a crucial part in awakening the infinite flame of love within. To help each person to remember the truth of our own infinite Divine powerful light. How essential it is to understand, accept and honour each persons journey. It is easy to blame another… for instance, the mother. We can blame her for not instilling in her child unconditional love, to point to the love that her child is in their core for them to nurture love for them self, instead of going out there in search of love and adoration. How essential it is for each person to understand another person… the mother, for instance has her own story, experience and acts as best she knows how. Her action is nevertheless an act of love that leaves within her child a seed of love for them to nurture love for them self. How essential it is for each person to realise their suffering/pain is based on a untruth and is there to help them awaken to their true magnificence and power. The New Energies work differently now, it is no longer a matter of fixing a person as each person has the opportunity now to choose for them self how they want to experience life AND no one else has a right to take this experience away, unless it is asked of them. 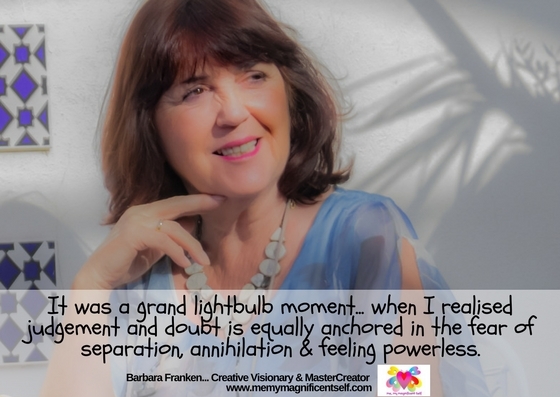 IAM 55 years and am grateful to have experienced this grand light bulb moment now… to realise how my anger was my blessing and transport me into this peaceful space. Knowing it all happened in perfect timing, so perfect I had already written my quote about it a few hours earlier. I knew all my own judgement and doubt about everything was all anchored in my believe of being separate, powerless and slowly dying…. I just had to allow my body/mind to feel it totally too AND transform the remnants of old sadness and anger from many lifetimes ago into a sense of peace and deep understanding. Life is wonderful and as I feel more and more light filling my physical body/mind, life becomes easier, there is more and more to celebrate. Celebrating my Human and Divine selves coming together in total balance AND being a tiny part in the magnificent tapestry of life. Sharing with others who are ready to open up to their own loving presence and celebrate together this new adventure as multi-dimensional beings. Thankyou Tom for giving me unconditional love and compassion these last 30 years… here’s to our next adventure together. Join my Local or Online MasterCreator Class and emerge yourself in the celebration of life through dance, song, art, meditation and beyond everything known… preparing yourself for your NEW role on New Earth.